Santeria — or "the worship of saints" — is gaining ground as a popular religious practice in Cuba. Developed in the African slave communities of the island’s 18th Century sugar plantations, it's a syncretic religion adopting elements of Spanish-imposed Catholicism while maintaining the central beliefs of Africa’s kidnapped natives, primarily Nigeria’s Yoruba tribe. Santeria has been practiced in Cuba for hundreds of years, ever since the first slaves arrived from Nigeria. As a practice rooted within a world of oppression, Santeria is shrouded in secrecy, surviving first the ruthless command of slave masters and imperial governance, and later the religious intolerance of Castro’s government. Cubans haven't heard of USAID’s ‘Twitter’ and they have enough problems already. Read more here. The religion owes its continued existence over the centuries to the prevalence of the oral tradition, with believers passing on, preserving, and nurturing its secrets through countless generations. Each of these clay statues is an “Ellegua,” which Santeria adherents receive in order as they gradually complete their initiations. Today, Santeria has emerged from the shadows of a Cuban society now at liberty to practice religion, and is witnessing not only an increase of acceptance but also of popularity. Santeria grew in social centers called Cabildos. The Cabildo pictured is one of the oldest in Cuba. It’s located in Palmira. In its earliest days Santeria was an exclusive slave practice — a rejection of the masters’ Catholic saints and the colonial Christian God — and it was the slave social centers (calbidos) of the tiny village of Palmira that witnessed its first inception. Millions of Cubans may lose their life savings this year. Read more here. Here, Cuban slaves congregated on a weekly basis in order to worship the spirit gods of Oloddumare and the Orishas, through whom they believed mortals communicated with the higher God. Santeria is not regarded as an official religion by the state, and therefore has no official places of worship. The Orishas are semi-divine beings, each expressing a specific aspect of human existence. Ochun is manifested in romantic love and money matters, while Oggun represents war, Chango embodies passion and virility, and Babalu Aye symbolizes healing. Animal sacrifice is an integral part of the rituals. In return, each enjoys one day of the year dedicated to his or her honor, on which Santeros will summon the Orisha through music, dance, and ceremonial performances in which offerings of food, rum, and animal blood are made to the present spirit. Babalawo blessing the people with ceremonial corn powder. As the religion has evolved, each Orisha has become firmly associated with a specific Christian saint; Yoruban Chango, for example, is now synonymous with Christianity’s young beheaded Santa Barbara. Santeros believe that blood rituals are necessary to release the negative energy and spirits of those involved. This form of worship demonstrates the equal faith that many of Santeria’s adherents have placed in both the Orishas and the Catholic saints. By accepting and adopting the beliefs of both Cuba’s historic oppressor and oppressed, they have formed a religion that can neither be labeled as truly Christian nor Yoruba, but instead inherently Cuban. 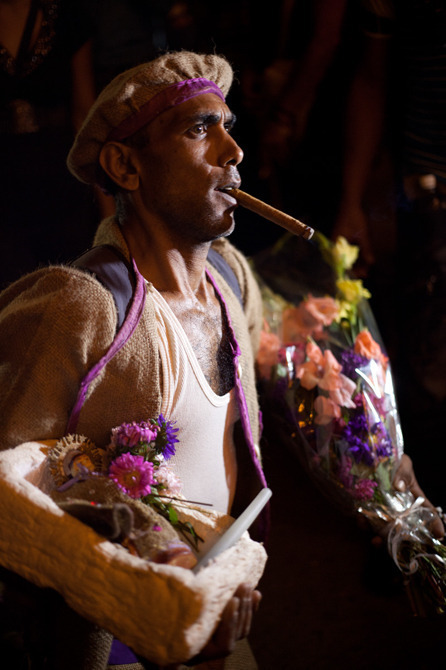 The ceremony of San Lazaro at El Rincon church lasts all night, culminating in a midnight mass. As with other syncretic religions practiced in Latin America, Santeria offers an outlet through which modern Cubans can fuse together a ruptured past. Rumors of Cuban forces in Venezuela are greatly exaggerated. Read more here. After centuries of underground existence, Santeria is becoming an open practice, with participation coming from all levels of society. Representing a shared identity, Santeria is a cultural inheritance, a dynamic form of worship — and a uniquely Cuban religion.